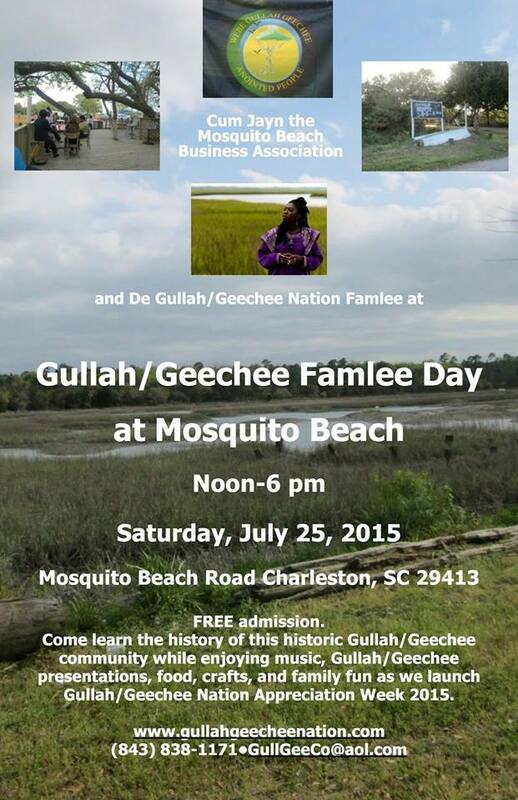 Queen Quet, Chieftess of the Gullah/Geechee Nation ( www.QueenQuet.com) and the Mosquito Beach Business Association are inviting the public to “Gullah/Geechee Famlee Day” to launch “Gullah/Geechee Nation Appreciation Week” on historic Mosquito Beach in Charleston County, SC. This event will take place on Saturday, July 25, 2015 from Noon until 6 pm featuring music, food, Gullah/Geechee crafts and demonstrations, tours of this historic Gullah/Geechee seaport community, and book, DVD, and CD signing by Queen Quet herself. Admission is FREE and the event is open to the entire public of all ages. In the late 1930s, Joe Chavis and Andrew Jackson Wilder, Sr. began evolving this island that was once an oyster factory run by native Gullah/Geechees into a resort area. Overtime, several seafood stands, restaurants, bars and dance clubs, and a boardwalk pavilion came to line Elijah Creek where Mosquito Beach sits. Numerous storms during the 1980s and 1990s damaged buildings there and business went into decline. However, this strong Gullah/Geechee community has come back together to revitalize and restore Mosquito Beach to its prominence and the “Gullah/Geechee Famlee Day” will be in support and celebration of these efforts. “Gullah/Geechee Nation Appreciation Week” started three years ago in the City of Charleston and has expanded to include the entire Gullah/Geechee Nation coastline from North Carolina to Florida. This year, it will take place over a nine day period in honor of the Emanuel 9. Each day will be dedicated to one of them. In order to keep up with the entire week of festivities, supporters are encouraged to follow www.gullahgeecheenation.com and @GullahGeechee on Twitter as well as the events posted to the Gullah/Geechee Nation Facebook fan page. You can also email GullGeeCo@aol.com or call (843) 838-1171. ← Gullah/Geechee Nation Appreciation Week 2016 Declared in Port Royal, SC! Will there be a book signing with Queen Quet at the International Music and Movement Festival on 8/1/15? This program speaks my heritage because I am from Sierra Leone, and my mom has a tribe link back home.